About them: NZQA plays a key role in the education sector for the NZ government. 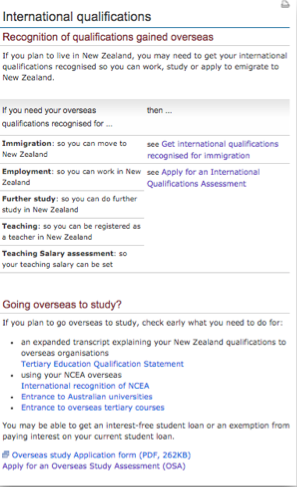 They're in charge of managing the NZ Qualifications Framework, and administering the secondary school assessment system, among other things. 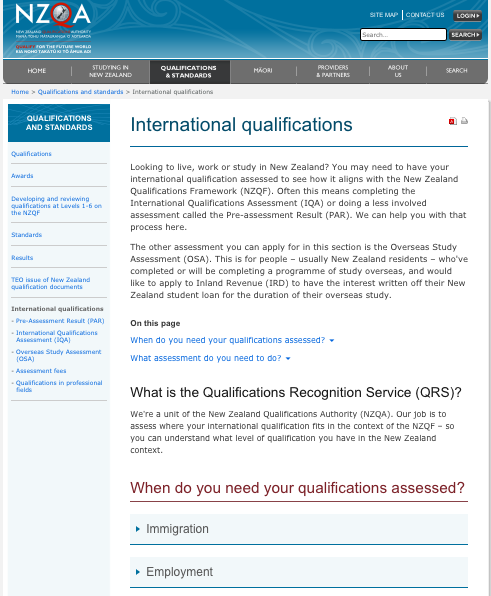 Work completed: NZQA desperately needs a new website – and that's in the works. 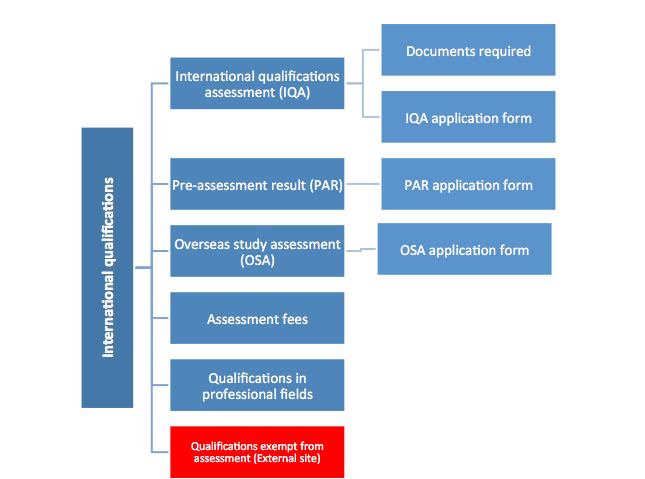 In the meantime, I was tasked with restructuring and rewriting a key section as a test case: the Qualifications Recognition Service (QRS). Staff morale increased, with the majority of applications to the team now containing the right information. Complaints within the team have reduced. 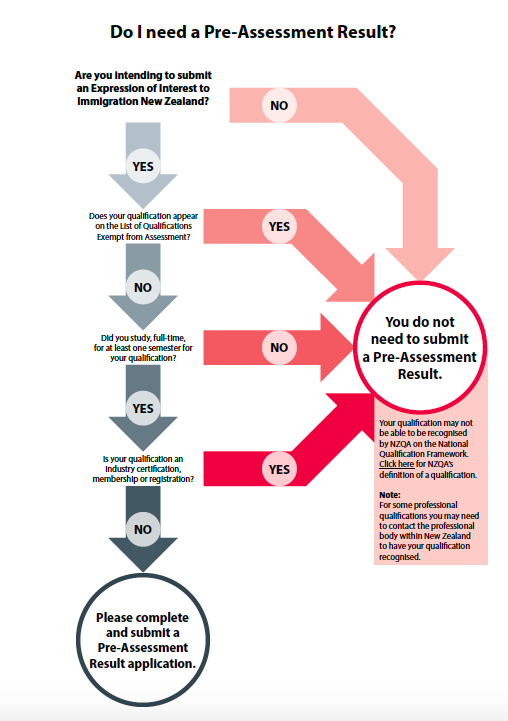 Applications have gone from 1 in 2 having incorrect/missing documentation with it to 1 in 5 - for the first time in approximately 3 years the scanning of applications in up-to-date. For larger or trickier jobs, I usually start by doing an audit of the current website. This means looking at the website page design, the IA, the content and the tone of voice, and forming a list of questions and suggestions to take back to the client. Often the people working in a business have a lot of great information in their head, but just need help drawing it out. I provided members of the QRS team with content briefs to fill out, then followed up with Skype workshops to fully understand their needs. Originally hired to do a simple tone tidy and rewrite, I soon realised that the section actually needed to be completely restructured, I presented my case with the help of proposed new sitemaps, and away we went. This section sets the tone - literally - for the rest of the website upgrade. I made the language much more user friendly and accessible, account for readers who don't have English as a first language. Service design, such as forms, is a whole thing in itself. 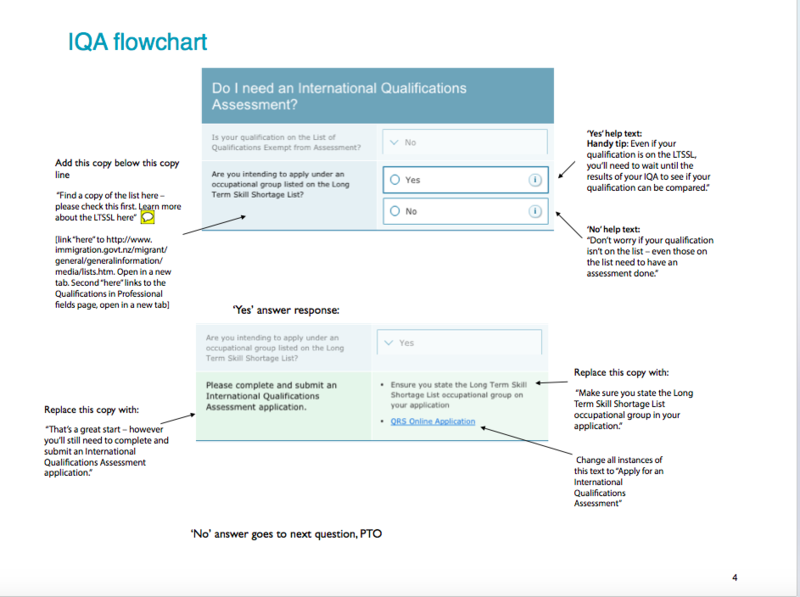 I worked with NZQA's expert to suggest improvements to the QRS section's important application forms. Whenever I review existing copy, one of the things I’m looking for is if we can turn any of the copy into a visual, or add a visual to support the copy. This can include anything from infographics to page and copy design suggestions.